When used in construction, steel contains between 25 and 100 per cent recycled content, is nontoxic and noncombustible, creates minimal waste during production, and is 100 per cent reusable or recyclable with no loss in properties. This point is particularly important as the ability for future generations to continually reuse steel products gets at the very definition of sustainability. The amount of energy needed to produce a tonne of steel has decreased by 31 per cent, and the associated carbon dioxide (CO2) emissions by 36 per cent since 1990, with more improvements on the way. The recent introduction of the newest iteration of the Leadership in Energy and Environmental Design (LEED) program—LEED v4—brings an increased focus on materials and resource transparency, and building professionals need to understand how material decisions can affect the project review and certification process. Steel-intensive building designs can be a significant contributor to earning points for a variety of LEED v4 credits, and may provide builders an immediate advantage because of the availability of supply chain and raw materials, and the lower energy use for all steel products. 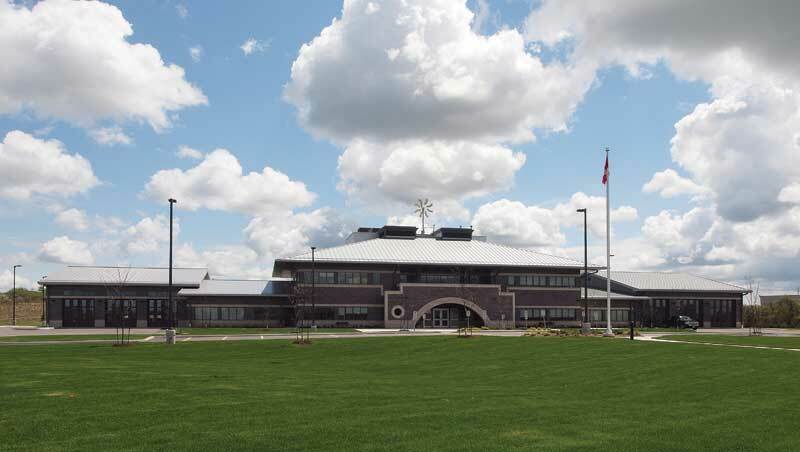 Located in Southwestern Ontario, the Guelph South End Emergency Services building received a silver rating under the Leadership in Energy and Environmental Design (LEED) program. 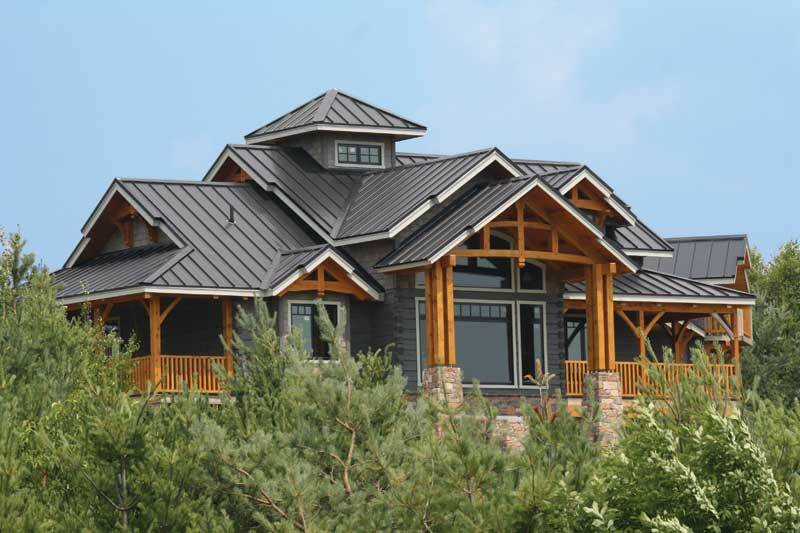 Its use of steel includes panels on the roof in light pewter and on the walls in charcoal. LEED can help bring architects, engineers, contractors, and other building professionals together early in the construction process to collaborate and plan for sustainable building design. LEED is increasingly referenced in planned building project specifications, so it is vital for construction professionals to remain up-to-date with the latest developments and requirements. Projects seeking certification can register for the USGBC and Canada Green Building Council’s (CaGBC) LEED 2009 rating system until October 31 of this year—at that point, registration closes and LEED v4 becomes the standard for any new projects. Originally set to close on June 15, 2015, LEED 2009 registration was extended to allow users and members of the green building industry additional time to prepare for LEED v4, which features a more rigorous certification process and multiple updates to the rating system. These updates are the result of a rapidly evolving industry with increasing demand for environmental sustainability. The development of LEED v4 has spanned more than three years, engaging hundreds of volunteers and thousands of stakeholders around the world. In order to follow an internationally consistent approach to how LEED is implemented around the world, CaGBC has developed alternative compliance paths (ACPs) within the international rating system, which identify equivalent means of demonstrating compliance with credit requirements specific to Canadians’ needs. Fifthtown Artisan Cheese Co. (Picton, Ont.) 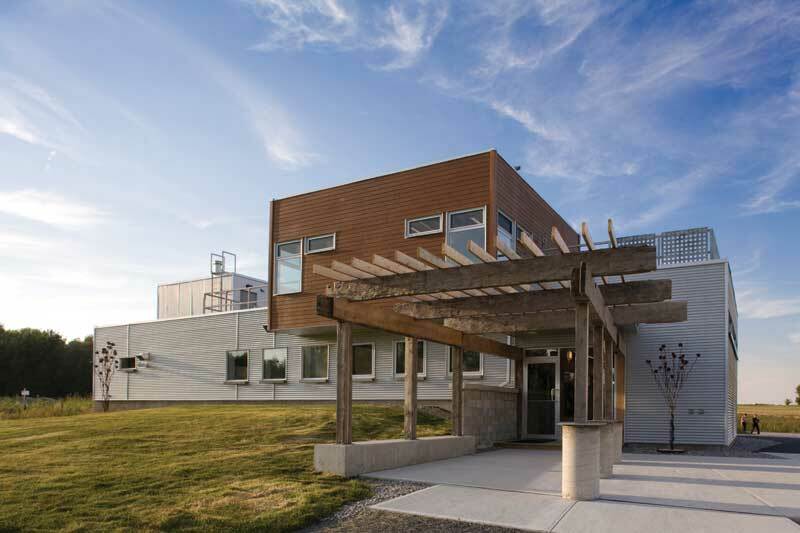 was the first Platinum-rated Leadership in Energy and Environmental Design (LEED) manufacturing facility in Canada. It features 22-mm (7/8-in.) corrugated galvalume cladding panels. LEED v4 takes a more all-encompassing look at buildings’ environmental sustainability, while also considering the health impacts to each building’s occupants. These human health credits are new to the LEED rating system, and can be achieved through a variety of documentation practices, including health product declarations (HPDs) and material health certificates. These documents were created to examine the potential human health impacts of products used in building construction, attempting to provide a transparent path to describing all the ingredients used in products and their related health hazards. In the interest of improving its rating system methods, LEED v4 also takes an expanded look at building material credits, including life cycle assessment, environmental product declarations (EPDs), and improved product transparency. Registration for LEED v4 is straightforward. It can be completed through CaGBC’s website, selecting the applicable LEED v4 rating system for each project. With LEED Online, the project team can then create a project profile to help co-ordinate and expedite the documentation and certification process.